← Sharing our love of Italy! 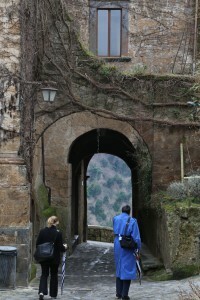 Walking through medieval arches, with a view of the valley beyond. Guests of The Quiet Garden Retreat have time to contemplate change in their surrounds and in themselves. One day we visited an ancient Italian hill town, built up over time with layers of lives. Etruscan lived here and hollowed out wells, storage and dwellings in the porous rock. Romans march through these valleys and medieval lords built fortifications. Now the walls are crumbling as the soft rock gives way. New vistas open up while modern tenants rebuild walls and roofs. Beyond each arch is a precious and unique view. Our lives are also built with layers of experiences: walls of defense, deep wells of emotion, stored memories – parts of ourselves we remodel and parts that fall away over time. Having time and space to notice all of these layers in ourselves is precious. We invite you to step out of your normal routines and come experiences these layers with The Quiet Garden.